Nate walked this restaurant one afternoon and noticed that everyone seemed to be ordering the same thing: steak and fries with a green sauce. Since it always had a line and this dish was apparently a favorite, we thought we should give it a try. We walked over one night, hopped in line and eventually were seated (they were even nice about the stroller). As we were looking around, we realized EVERYONE had the same food. The waitress came over, asked us how we wanted our meat cooked and that was it. You get a salad, two servings of steak and fries and that’s the menu. Nate asked what was in the green sauce and we were told it’s a family secret. 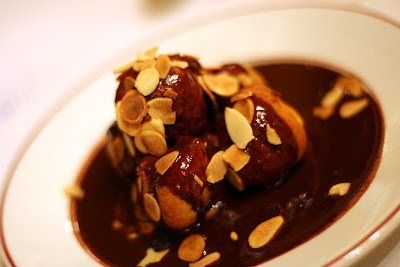 We topped the meal of with some profiteroles, which were awesome. These little pastries were filled with vanilla ice cream. And the chocolate sauce tasted a LOT like our own secret family recipe for hot fudge. It was such a fun night. The food was delicious, the patrons and waitresses alike loved Anna (one waitress literally almost kidnapped her…kinda scary), and it was just a great memory. Thank you Relais de L’EntrecÃ´te! You ate at my absolute favorite restaurant. 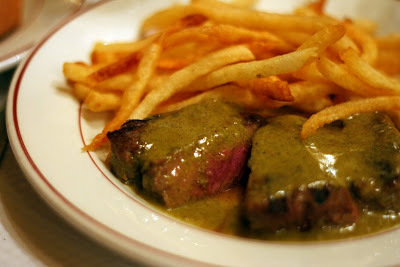 I dream of the entrecote and their mysterious green sauce. I am WAY jealous. 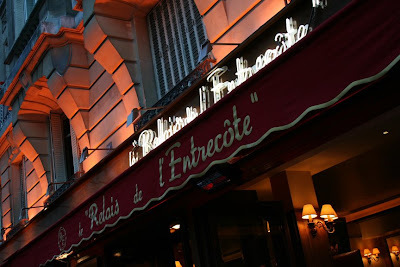 Whenever I go to Paris to visit my mom, l’entrecote is a must-eat at stop. 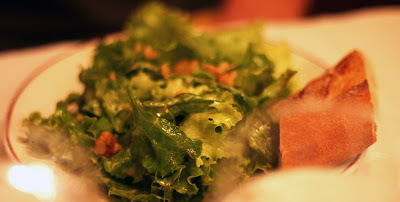 I think there’s some sort of walnut in the sauce, a lot of parsley, some garlic…. not sure about the rest. You’re going to think my sister and I are stalking you! That’s my favorite restaurants too! I’m convinced there’s some curry in the sauce. Rumor has it that the waiters and kitchen staff don’t even know what’s in the sauce. The owner brings the spices already mixed together. Weren’t those fries to die for? We also went here during a recent trip to Paris. Our guidebook said the secret ingredient is chicken livers, which explains the interesting color!! We have been going to this restaurant for years, everytime we go to Paris it’s our first stop. Many years ago there was a restaurant in Sherman Oaks, Ca. with the same name and menu. I remember it closed on a New Year’s day because of a high rent increase, they never reopened. Everyone wanted to buy the sauce. it just makes me so sad when high rents close the doors of great places!!! thanks for sharing, henya!